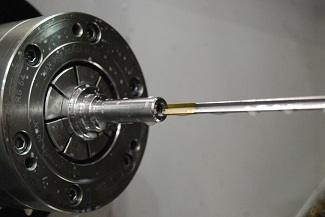 Looking at tasks from a new perspective can yield significant benefits, which is why we sometimes choose gun drilling as part of our machining strategy - even when it may not be the most obvious solution. Recently, the decision to use this technology enabled us to reduce the number of components in a tool set from three parts to one, resulting in considerable overall cost and time savings for our customer. As its name suggests, gun drilling produces deep, straight holes, and was originally used for the manufacture of gun barrels. Even though it is now quite widely used, particularly in the oil and gas sectors, we think it has plenty to offer in other situations, including prototype and pre-production work for the aerospace and medical sectors, as well as for engineering mould tools. We undertake gun drilling on a variety of standard and exotic materials, with diameters from 1mm to 10mm and depths of 30 or more times Diameter on both our high specification 5-axis Mori Seiki and Roeders 601DSH machines, which provide extreme accuracy and stability and offer us maximum flexibility for work scheduling.